Stockpair no longer offer binary trading. For a list of alternative brokers, and full comparison reviews, visit our brokers page. Stockpair is one of the most highly regarded Binary Options and Pair Options trading platforms available online including the option to choose from 100 different trading assets. The Stockpair binary options online trading platform is user-friendly and designed to make trading hassle-free an accessible to everyone from beginner to expert traders. The browser-based platform allows for instant access and requires no download and setup whatsoever for the end-user’s convenience. Stockpair offers more than just an easy to use trading platform: they also feature no restrictions bonus promotions to their clients and Stop Loss/ Take Profit as an added incentive for trading via their system as well as Volume Cash Back. Right now the current promotion available on their website awards user with a 100% bonus on all deposits made that are over $500. We recommend you check out the official site for full details as new and ongoing promotions are constantly being updated. Stockpair has designed a platform that is suitable for traders of all types, regardless of experience or account size. The minimum deposit amount is $200 and the maximum is $50,000, thereby allowing everyone from new traders to seasoned an access point to trading on the markets. Accounts can be operated in multiple currencies and opening a new account is quick and easy and can be done from the convenience of your own PC. Stockpair is available in English, French, Italian, Spanish, German, Dutch, Arabic and Greek. After opening a new account, traders will find the browser-based platform very easy and convenient to use from any Internet access point. They also accept a number of different deposit methods for the user’s convenience including: most major credit and debit cards, bank wire and Moneybookers. Stockpair’s live trading platform allows user to make instantaneous traders on all the major markets including Commodities, Stocks, Currencies, Indices and Pairs, totaling over 100 tradable assets from 8 different markets spread out around the world. The unique Stockpair platform features flexibility and high profitability with the potential for huge returns of up to 350% per trade. The user can easily set the desired time for trades, which range from as little as 5 minutes and go up to 150 days. Stockpair offers something for all types of traders. The Stockpair platform also features several popular instrument types, including options such as One Touch, High/Low, and thereby making it appealing and accessible to just about every type of trader. To determine the reliability of any given binary options broker, several different criteria needs to be assessed. Stockpair makes use of a proprietary trading platform that is easy to use and is also very reliable. The platform functions smoothly with hardly any issues and Stockpair offers a high payout amounting to about 80% on your investments. In addition to this, they also offer an attractive 100% bonus on your trader account, so you can take complete advantage of the high payouts that can be derived from binary options trading. Stockpair offers several payment options that help secure your transactions, including CashU and MoneyBookers. Stockpair has already built a reputation for offering fair pricing and timely customer service. They place a heavy emphasis on keeping their clients satisfied and feature a friendly support team, which is available to help in case you run into any snags along the way. Customer support is available round the clock via live chat, phone and email. Deposits and withdrawals and easy and secure and can be made via a number of popular payment methods including major credit and debit cards, bank wire and Moneybookers. 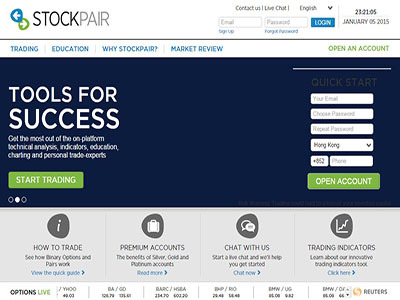 Stockpair also features an in-depth FAQ section on their website and tutorials for helping new traders get started. Overall the Stockpair platform is a breeze to use, even for those with no prior trading experience. They offer a wide range of trading options for all the major markets, as well as short and long term trades, which is sure to appeal to a diverse group of traders. They also feature some nice incentives like the no restrictions bonus, stop loss/take profit and volume cash back. Their reputation for transparent and fair pricing along with a strong emphasis on customer satisfaction make them a great choice for just about anyone interested in Binary and Pair Options with over 100 assets.